Look down upon your master's eyes. You are numb and stiff, you represent our lives. Your body, design and your life. HONESTLY, you feel like an ant when you roam about the streets of Chicago, USA. In most parts of the city you are shadowed by soaring skyscrapers, proud and stubborn, completely ignoring and not even looking down on you. The entire city is like a living architectural portfolio painted by some of the most prominent architects to breath; and among this sophisticated metropolitan, the most magnificent of them all is permanently tagged by the name of a Bangladeshi. I am talking about none other than the 110 storied 442 m (without the antennas; including the antennas the total height is 527 m) Sears Tower! Sears Tower was the world's tallest building from 1973 to 1998, and is currently world's third tallest building. The building was designed by the famous structural engineer Fazlur Rahman Khan. In 1972, named the Construction's Man of the Year, F. R. Khan is a bachelor's graduate from Dhaka University and conducted his master's and PhD from University of Illinois at Urbana-Champagne on a Fulbright scholarship. F. R. Khan's central innovation in construction was the idea of the "tube" and "bundled tube" structural systems for tall buildings. 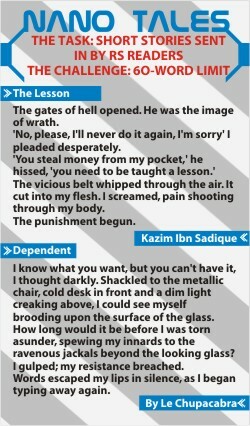 Another innovation that Khan developed was the concept of X-bracing. This concept reduced the lateral load on the building by transfering the load into the exterior columns, which allowed a reduced need for interior columns, thus creating more floor space. F. R. Khan is most noted for his efficient designs of the 100-storied John Hancock Tower and the Sears Towers. He epitomized both structural engineering achievement and creative collaborative effort between architect and engineer, emphasizing on the fact that architecture's constructive art can only be celebrated when grounded in structural realities. Out of the many awards he received, the Government of Bangladesh also awarded him with the Independence Day medal in 1999. The Sky Deck of the Sears Towers on the 103rd floor, 412 m above the ground, is a famous tourist attraction in Chicago where the tourists can experience how most skyscrapers sways on a windy day. The view is also absoutely preposterous! One can see far over the plains of Illinois and across Lake Michigan to Indiana, Michigan and Wisconsin on a clear day! 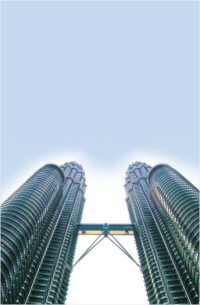 Soaring 452 m high, the Petronas Twin Towers, like guardian angels, look over the city of Kuala Lumpur, Malaysia. Architectural design by Cesar Pelli, the twin buddies surpassed the Sears Tower and became the world's tallest building in 1998 till 2004. Currently it is the world's second tallest building. Patronas is Malaysia's national oil company and quite a flourished one at that! The 88-floor towers are constructed largely of reinforced concrete, with a steel and glass facade designed to resemble motifs found in Islamic art, a reflection of Malaysia's Muslim religion. Cesar Pelli, born in Argentina, amazingly also completed his studies from the School of Architecture of the University of Illinois at Urbana-Champagne. This University seems to produce very “high” thinking personals, don't you think? He also was the Dean of the School of Architecture at Yale University in 1977 till 1984. In terms of architecture, he is known for his extensive use of curved facades and metallic elements in his designs. Interestingly, Cesar Pelli is also the architect of the main building, Joe Rosenfield Center, of Grinnell College, USA, where I am right now, and is supposedly a prime affinity for architecture students. A major attraction of the two towers is the 170 m high and 58 m long skybridge connecting the two Towers, which is free to tourists. Cesar Pelli's comment about the pedestrian skybridge is a very interesting one; he said that, “the pedestrian bridge ... with its supporting structure creates a portal to the sky... a door to the infinite." Talk about someone in love with heights and several screws missing from his mind. Don't have access to climbing Mount Everest? Who needs Everest when these gargantuan giants are right around the corner. Alain Robert, nicknamed Spiderman, attempted to climb both the Sears Tower and the Petronas Towers (Tower 2, to be exact). Climbing is one thing, but using only his bare hands and feet and with no safety devices of any kind, he scaled the building's exterior glass and steel wall! This French urban climber, without any former notice, climbed the entire 110 storied Sears Tower using only bare hands and feet in August 1999. He had attempted the same with the Petrunas Tower in March 1997; but apparently, the Malaysian police were expecting such an attempt and arrested him at the 60th floor, 28 floors away from the “summit.” He attempted it again exactly 10 years later in March 2007, but was arrested again on the same floor. The nickname “Spiderman” certainly suits him; the only problem is that he does not wear a red underwear over his pants. The 509 m high, 101-storied (hence the name) Taipei 101 currently holds the record for world's highest building, located in Taipei, Taiwan. Designed by the Princeton Graduate, (it is interesting to think all the three architects are US university higher degree graduates) Chinese Architect, C. Y. Lee, the exterior of the building is fraught of symbolism of financial success. The distinctive sections that create the impression of a bamboo stalk in the minds of many people are actually representative of gold ingots, used in ancient China as currency by royalty. 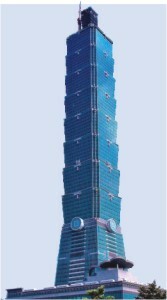 In many aspects, Taipei 101 is the most technologically advanced skyscraper constructed to date. The building features fiber-optic and satellite internet connections allowing speeds up to 1 gigabit per second! Toshiba has supplied the world's two fastest doubledecker elevators which run at a top speed of 16.83 meters per second (63 km/h or 37.5 mph) and are able to take visitors from the main floor to the observatory on the 89th floor in under 39 seconds! There are are also two observation decks for tourists; an indoor one at the 89th floor and an outdoor at the 91st floor. Bangladesh's tallest building is the 30-storied Bank of Bangladesh, soon to be surpassed by the 37 storied City Center. Clearly Bangladesh has a long way to go before skyscrapers decide to manifest the country. However, Bangladesh has several wonderful architectural structures, including the Parliament House by Louis I Kahn. Without mentioning the works of architect Mazharul Islam, known as the pioneer of modern architecture in our country, the article would be incomplete. He is responsible for the famed designs of Nipa Bhaban at the Dhaka University campus, Jibon Bima Corporation Building, Jaipurhat Limestone and Cement Project, National Archives and Library, Jahangirnagar University, Chittagong University and Charukala Building, and is immensely acknowledged all over the world. If you are interested in seeing some of the tallest skyscrapers in the world at the same time, you should visit China, which holds the record for having 9 out of the 20 tallest buildings in the world. It is simply amazing to think how far and high we humans dream of and succeed in carrying them out. Cesar Pelli's desire to create a “door to the infinite” is invariably shared by the ambitious lot of us. In this case, the infinite is the sky.